The deign origin from the south East Asia building. Where is the place still full of rain forest up to 2009. People keep of using a lot of the natural resources to build their home and their daily utilities and tools. 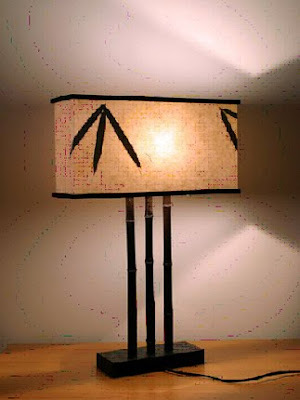 It captures the similar idea of making the bamboo lighting likely the minimized home of south East Asia. And the shelter is made with paper materials with some real bamboo leafs stick together. The 3 foots are also the real bamboo where the south East Asian still use it for building their temporarily place for managing their lands, fish circle and animal farms. In their view of it, it means hold up a sun shine day. All materials from that lighting are completely environmental even the stand base is the bamboo made too.